We’ve got a couple of friends who are huge proponents of local, homegrown music. A few times a year they give selflessly to put on a mini music festival of sorts – something that showcases local talent and allows us to see all our favorite local bands in one venue. These festivals are usually all-day events, and sometimes the Omnivore plays in the bands – sometimes he doesn’t. This last go-round he wasn’t playing music, which is nice because being a lonely band wife in the audience isn’t always the most fun thing. I was pretty pumped to create a picnic dinner for us to share but I was totally lacking inspiration. Finally, I remembered this entree and I am so glad I did. While the sun was setting and people began to eat, hot dogs appeared alongside store bought potato salad and cold fried chicken. As I whipped out my real dinner plates (I have guilt about paper plates), silverware, and this beautiful salad, passers-by definitely took note. This meal was so perfect. It is served cold or room temperature, has veggies, fruits, and protein all in one. Honey and feta is a wonderful combination. The soft grapes contrasted with the crunchy almonds wonderfully. *This can be made vegetarian by substituting a can of garbanzo beans for the chicken. Whisk together the olive oil, honey, vinaigrette, vinegar, and water. Taste and adjust as needed. 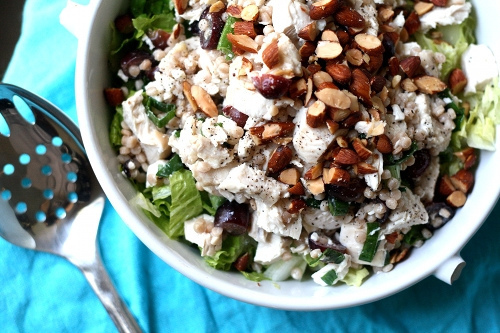 Combine the cooked chicken, cooked wheat berries, grapes, feta and dressing in a large bowl. 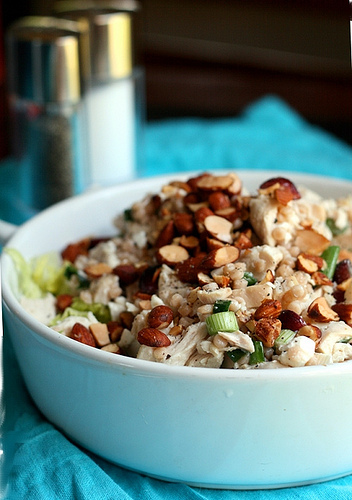 Top with green onions and almonds. This entry was posted in Brady Evans Venables, Cooking, Food, Recipes and tagged Brady Evans Venables, Columbia, every woman blog, Famously Hot, Honey Feta Chicken Salad With Grapes and Almonds, Midlands, recipe by lexingtonmedicalcenter. Bookmark the permalink.